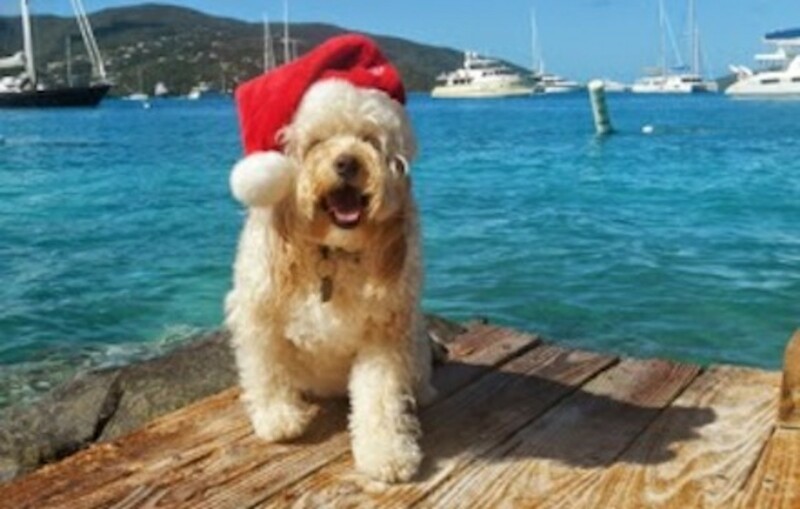 The Parkers, their animals too, explore the Bitter End and Biras Hill for the holidays, discovering the best dinner they've had in the Caribbean. We took the dingy ashore to explore Bitter End. The Yacht Club&apos;s facilities stretch along and climb up steep Biras Hill behind which forms a peninsula with Bitter End occupying the north and east edges. 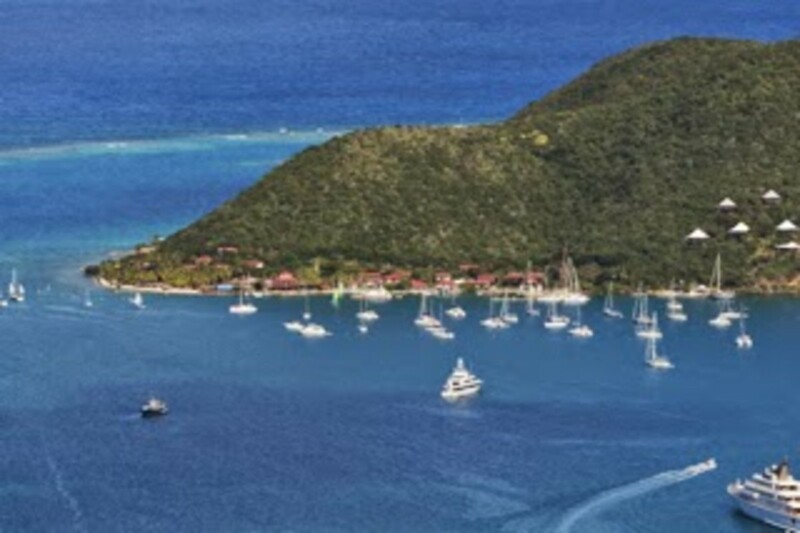 About two thirds of the Yacht Club&apos;s facilities face North Sound to the east, and about a third face Eustatia Sound to the North. Along the shore is a series of individual beaches with palm trees, manicured mangroves, cushioned lounges, hammock, thatched shade structures and a pool. Between the beaches on the North Sound side are several marina piers, a fuel dock, restaurants and structures supporting every imaginable water sport. Immediately behind the beaches is a mostly concrete brick paved path separating the beach from natural weathered wood cottages with cantilevered balconies surrounded by natural growth, stepping up the hill. Between the cottages and the brick path is a well groomed landscape with red, white, purple and magenta bougainvilleas and pink oleanders along with a varity of other plants. A pre-Christmas stop at the Bitter End Yacht Club. Behind the path on the hill side of the marina and water sports area is a another restaurant, an emporium, gift shops and a sailing school, all in separate buildings. Walking on this section of the concrete brick paved path, you feel like you are in a New England seaside village. Eustatia Sound is formed by virgin Gorda to the south, the east end of Prickly Pear Island and Eustatia Island to the west, and Eustatia Reef to the north east. The Reef stops the ocean swell but is open to the east and north east prevailing winds creating a perfect area for wind surfing and kiting. The Reef is also excellent for snorkeling and scuba diving as are many other reefs in the area. For the sailor, Bitter End Yacht Club rents Hobie Cats, a varity of small monohulls, larger monohulls in the 30-foot range, and small whalers for the power boaters and fisherman. They also rent kayaks and paddle boards. Their sailing school has several programs for those who want to learn to sail or improve their skills. In all, a paradise for those who love boating and water sports. 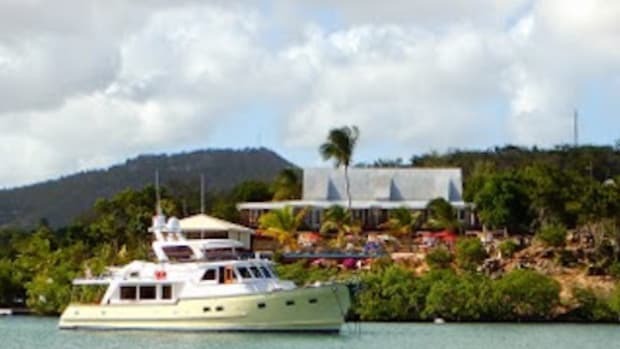 We arrived by dingy at the Caribbean Outpost of the Italian Yacht Club Costa Smeralda, for Christmas dinner. The Yacht Club Costa Smeralda was founded in In 1967 at Porto Cervo in Northern Sardinia. 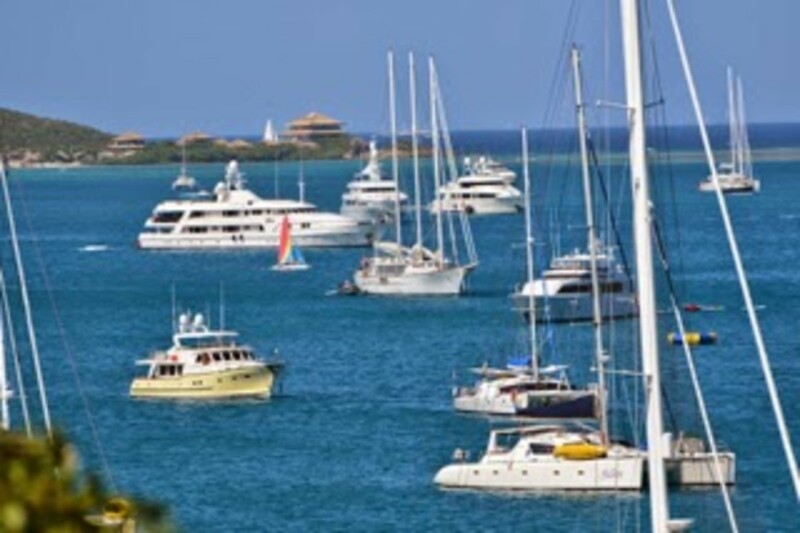 The club was an Americas Cup contender twice and yearly sponsors several international regattas including the warm up to the St. Barths Super Yacht Bucket Regatta. The Club&apos;s facilities in North Sound, with its superyacht marina, were completed in 2012, and are exquisite. Catalina Sunshine&apos;s holiday spirit in full effect. 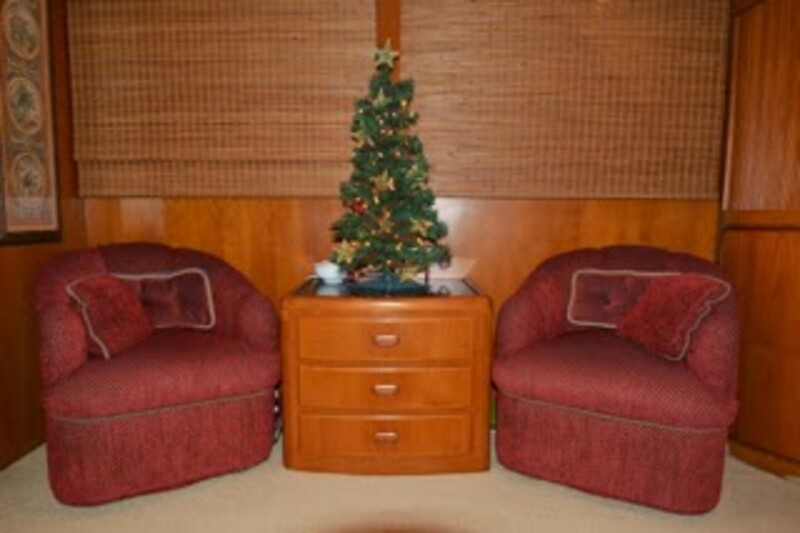 We warmed up to Christmas watching a Christmas Eve Boat Parade through the moored and anchored boats in North Sound, and our lighted Christmas Tree in our saloon. Earlier in the day on Christmas Eve, we took a picture of Jackie from the Bitter End Docks with a santa&apos;s hat which we emailed to friends and family (See top photo). Santa brought Jackie a ginger man for Christmas which she carried around all day displaying her appreciation. The Yacht Club&apos;s dinning room is at the top of the club house on a terrace overlooking an infinity pool a half level below. We were early and were escorted to a front row table just above the pool. From here we were looking back, and down, at Bitter End, and over the entire north half of the North Sound anchorage with many of the boats lighted for Christmas. The view and accommodations were fantastic. Tied off at Biras Creek &apos;s dingy dock and walked up the hill for dinner. Our table at Biras, where we had the best dinners we&apos;ve had in the Caribbean. Biras Creek is a 40-year-old Resort with 31 cottage suites, most located on the beach of Berchers Bay. The Resort has 140 acres uniquely nestled on a mostly flat piece of land between three hills creating three access points to the water: the first to North Sound with the Resorts own Marina dock; second to Deep Bay which is protected by Eustatia Reef beyond, with the Resorts palm tree lined sand beach at the south end of the Bay and it&apos;s water sports center; and the third Berchers Bay with its exposure to the Atlantic. In addition the Resort has an active helicopter pad to transport guest to and from the airport, tennis courts and horse stables. Between the cottage suites along Berchers Bay is a pool sitting on the ocean front. At the center of the three water exposures Is a small hill with the Resort&apos;s restaurant, library, spa and fitness center, and gift shop. The restaurant is at top of the hill in a stone castle like structure with views of North Sound on one side and the Atlantic Ocean on the other. 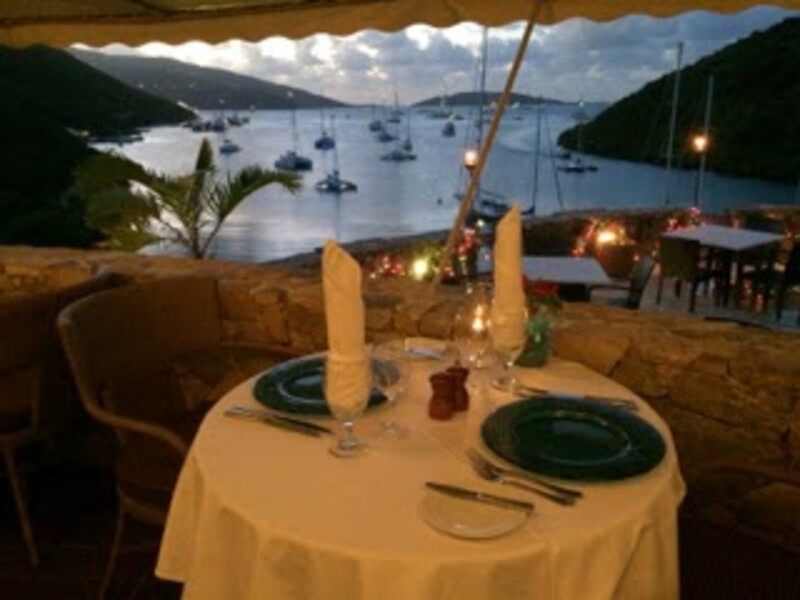 We ate the best dinner we have had to date in the Caribbean, overlooking the Marina and North Sound beyond. 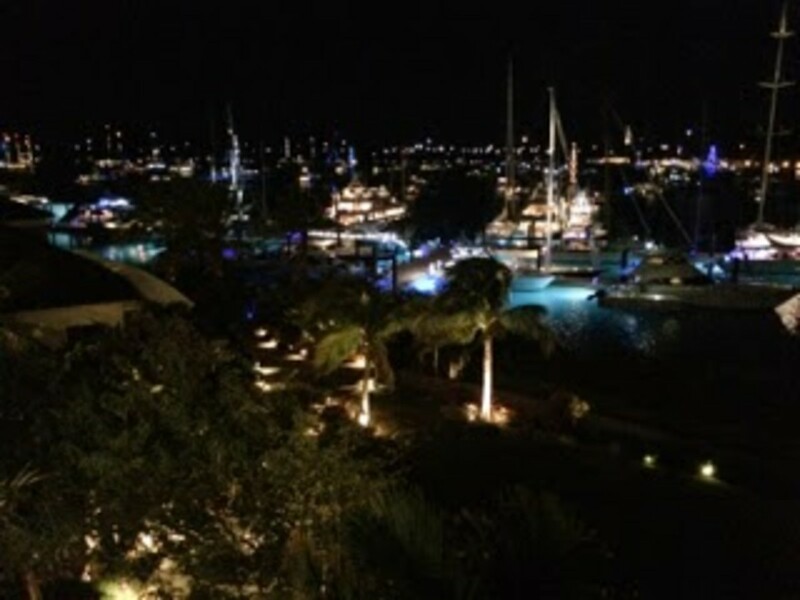 Landed at the dingy dock of the Costa Smeralda Yacht Club for a New Year&apos;s Eve celebration. Boats had been coming into North Sound for the last two days including Steve Jobs&apos; modernistic megayacht which he never had the opportunity to use. We believe there were at least 500 boats in total. And we were the only trawler! Not the worst way to welcome 2015. 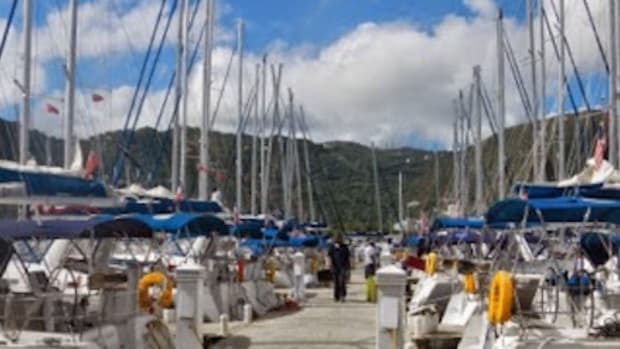 To accommodate all the yachts booked for the night at the Yacht Club&apos;s docks many of the guests were required to anchor, back in to the pier to stern tie, and to drop their boarding ramps. 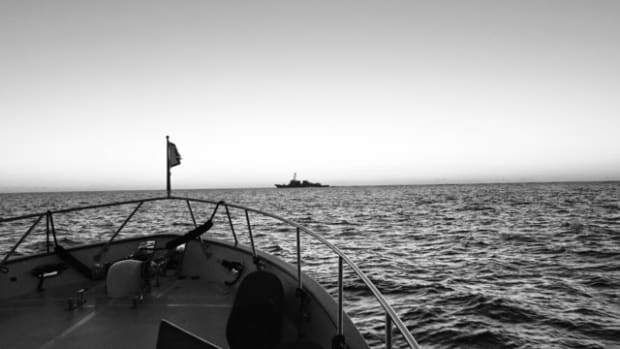 Sitting on anchor directly across from the club we watched one megayacht after another drop both anchors, crisscrossing with one another, and back down to stern tie. Some skillfully managed the operation cleanly in one shot, others required more time and effort. 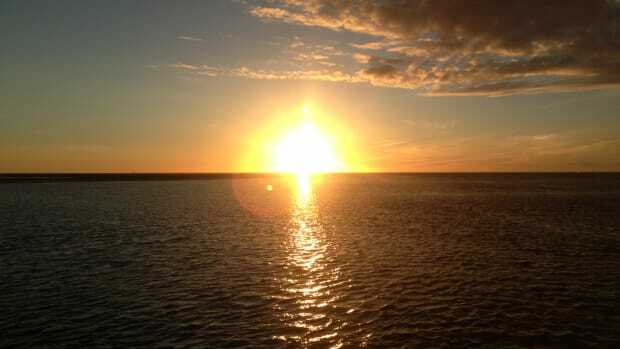 As it had been at Christmas dinner, the view from the yacht club terrace was spectacular. We had champagne and hors d&apos;oeuvres at the pool deck level and dinner a half level up. Our sailing friends from Brunswick and Newport Beach California had invited us to join them and two other couples, also from Newport Beach, who had come to join them for New Years. We had a great dinner, followed by dancing at the pool level and the traditional count down. What a great way to ring in the New Year. 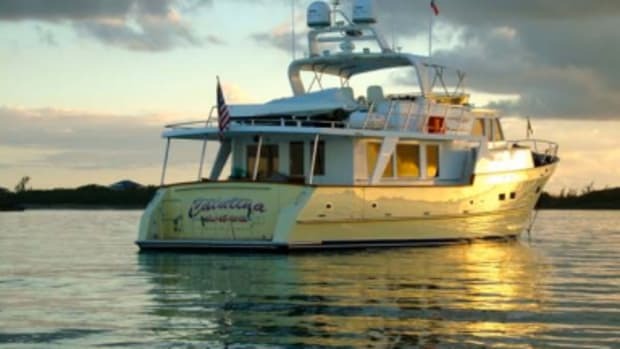 Catalina Sunshine anchored for the new year. She&apos;s the one with the yellow hull. Want to see more of the Parker&apos;s travels? Visit their blog here!